Citizen Machinery has incorporated its LFV (low frequency vibration) chip-breaking technology into the 12-axis, 25 mm capacity Cincom D25-VIII sliding-head turn-mill centre. LFV enhances the lathe's production flexibility and efficiency, especially when turning difficult-to-chip materials that traditionally produce long, stringy swarf, such as copper, plastics and steels with high alloy content. Grooving, thread cutting and drilling can also benefit from LFV. The latest D25-VIII LFV features the Industry 4.0-ready Mitsubishi 800 CNC system with touch screen and QWERTY keyboard. A trio of axis control groups are provided so that three tools can be in-cut at the same time, while simultaneous 5-axis machining capability is utilised for producing complex parts. When LFV technology is applied to a cutting cycle, it encourages chip breaking without the need for high-pressure coolant by rapidly oscillating the tool in two axes with the rotation of the machine spindle. This functionality is in contrast to intermittent chip-breaking action being programmed into a cycle as a macro, which can generate heat and cause insert tips to wear prematurely. 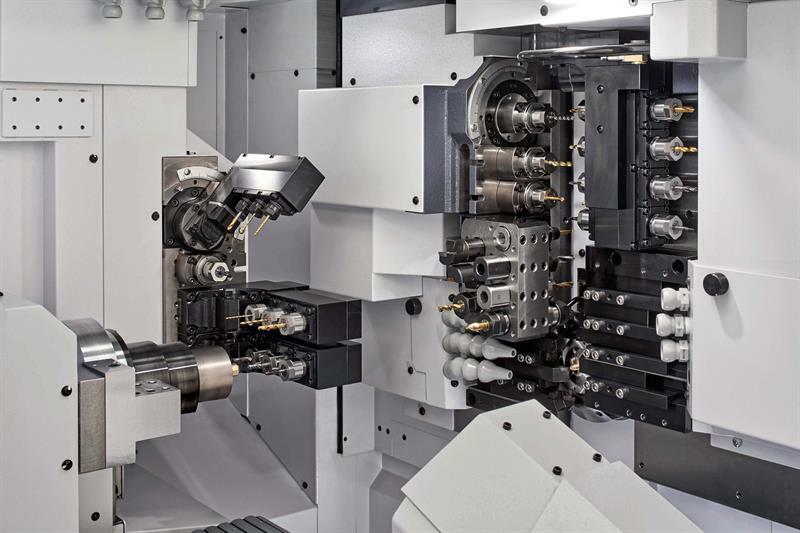 In addition to offering other advances in the machine’s operational functions, the simultaneous 5-axis control ensures that the contact angle between each engaged cutter and the component is maintained during the production of complex parts, enhancing surface finish, reducing cycle times and extending tool life. The Cincom D25-VIII LVF has gang tool posts in front of and behind the spindle centreline, with Z-axis motion provided on the rear carrier to allow balanced turning, milling or drilling, or simultaneous rough and finish turning. There is also a 135° swivelling B axis on the front post carrying up to four driven tools on either side to service both the main and counter spindle. This configuration is believed to be a world first. A manually set tilt spindle can be mounted on the rear gang carrier and back tool post. Together with the advantage of programmable chip size control, the tilt spindle has the ability to help eliminate deflection when turning very small, precise diameters. An optional, 2-axis, opposing tool carrier next to the counter spindle provides a facility for reverse end machining at the main spindle. 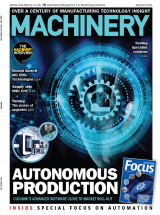 For executing complex cycles, operational flexibility is maximised by deploying up to 59 tools in the cutting area, coupled with the advantage of being able to remove the guide bush for more economic material usage when producing shorter components. The main and counter spindle are rated at 5.5 kW and 3.7 kW respectively, and both have a maximum speed of 10,000 rpm. Gang-driven tool stations are powered by 2.2 kW drives with maximum speeds of 9,000 rpm, while live cutter speed in the back tool post is up to 6,000 rpm. Rapid traverse rates are 32 m/min, with 24 m/min available in the Z axis of the rear gang tool post. Just 1.5 by 2.55 m of space on the shop floor is required to accommodate the machine. To meet LFV technology demands, the 3.4-tonne Cincom D25-VIII LVF is mounted on six legs, while drive is through 25 mm diameter ball screws, adding 16% to the rigidity factor of the lathe. A fully opening guard gives access to the work zone for easy setting, and an additional sliding door is incorporated at the rear of the machine. Twin coolant pumps are included with a 200 litre tank. A 90 mm wide workpiece conveyor is offered as standard.